FX-Sport unveils new VR2 smart sport headphones concept | What Hi-Fi? Music has now become commonplace in exercise and is thought to have a positive impact on your workout, which means choosing the right headphones is an increasingly important call. 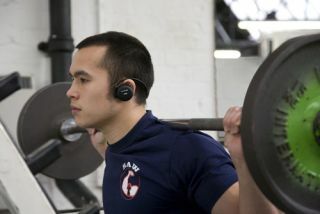 Wireless headphones could well be the way to go, removing the wires that could restrict movement – a factor that is no doubt behind the latest concept from US-based company FX-Sport. The VR2 headphones are smart and wireless; designed to be a lightweight and comfortable pair of buds that come with a built-in MP3 player that FX-Sport says offers "superb quality audio". You can also upload custom workouts to the headphones that will turn them into your own personal trainer for a range of activities – including swimming, with their water-resistant build. The new VR2 headphones are a development on its existing VR1, which FX-Sport says were "only on the market for a short time" but had attracted the attention of "several world class athletes". And with new development costs associated with the VR2s, a Kickstarter campaign has now started in a bid to raise $50,000 towards new firmware and other design and development work. FX-Sport is also working on creating the Workout Store – an app store designed specifically for your workout and containing training apps that upload to the purpose-made wireless headphones. If you're interested in the VR2s, the Kickstarter campaign runs until July 12th and a pledge of $99 – £60 – could secure you an early bird offer of a VR2 and all updates, excluding $6 UK postage. However, the VR2s aren't the only smart wireless headphones tailored for physical activity that have been unveiled this year – Bragi also choosing Kickstarter to make The Dash a reality. Described as the "world's first" smart wireless headphones, The Dash is a combination of biometrics, audio and Bluetooth connectivity with an embedded 4GB/1000-song music player.